REVOLUTION CONQUERED THE CHARTS WITH A #1 DEBUT ON BILLBOARD COUNTRY ALBUM CHART AND #8 ON BILLBOARD'S TOP 200! Nashville, Tenn. (October 7, 2009) - Singer/Songwriter Miranda Lambert started a Revolution with the #1 debut of her critically acclaimed third album. Revolution, with first week sales of 65,875, joins her previous two releases which also debuted at the very top of Billboard's Country Albums Chart, making her one of three country artists in SoundScan history whose first three albums all landed the #1 spot out of the box. With an increase in first week sales of over 20% between each album* and also having the #1 digital debut by a female country artist in 2009 (Revolution is the 6th top digital country album debut overall in 2009), Lambert has solidified her position as a mainstay in country music. The two-time GRAMMY nominee and platinum-selling artist received rare perfect reviews from countless publications including 4 stars from Rolling Stone and USA Today, an 'A' from Entertainment Weekly and exuberant praise from SPIN, NY Times, Washington Post and more. Many have claimed Revolution as the "Best Album of the Year" in any genre including Houston Chronicle and NPR's All Things Considered. "I'm so excited the fans are loving this record as much as I do!" says Lambert. "I know everyone says they are proud of the album they make but I feel this one is so special I can hand it to my idols, hold my head up and say 'Here, this is all of me. I hope you like it.'" In fact, on a recent industry red carpet, Lambert did just that to one of her idols - the legendary Patty Loveless. "I figure if it passes that bench mark then everyone else is sure to love it too!" This seems to be the case as the critics and fans weigh in. When asked recently if she reads her album reviews, Lambert excitedly said, "Oh yes! I read the good ones!" Last week, while in the Big Apple to perform on Letterman, Good Morning America and Late Night With Jimmy Fallon, Lambert completed a frenzy of media interviews. Along the way, the 25-year old Texas bombshell churned out a multitude of wise-cracks and tweeter-worthy remarks. When she and her band were asked to ride the mechanical Bull at Johnny Utah's for a video moment for www.abcnews.com (airs October 9): "Nobody's gettin' on that thing. We ain't drunk and we ain't 12. Well, we might be drunk but we definitely ain't 12!" When asked what her fantasy tour would be without hesitation: "Me, Merle and Beyonce' and when asked who she missed the most while traveling, she immediately replied "My dogs!" 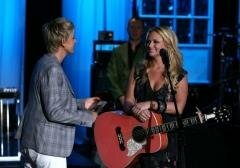 This week, Miranda appeared on the West coast taping a performance on The Ellen DeGeneres Show (aired October 6) and The Bonnie Hunt Show (airs today). Miranda's mom, Bev Lambert actually introduced her daughter and band live on the show but not to miss out on the action, Miranda's dogs Delta and Delilah hung out with Actress Kristin Bell back stage. HBO's Hung actor Thomas Jayne met Lambert while at the TV Guide Channel (airs today) and told her he and his wife Patricia Arquette are fans. E! News caught up with Lambert when she threw her band and crew dinner at Saddle Ranch - the closest thing to Texas they could find and GAC's Storme Warren flew to LA specifically to catch her when he missed the infamous Ryman performance (airs beginning Oct.22). After completing her last interview of media mania and totaling 27 days from home, Lambert caught a red-eye and headed for much needed R&R at the farm. Then it's back on the road, for Lambert who will headline her own shows as well as be Brad Paisley's special guest on his highly successful American Saturday Night tour. Lambert will appear on the following 19 added dates. 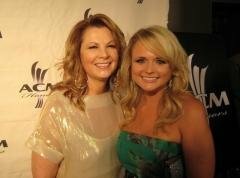 Miranda is currently nominated as this year's CMA Top Female Vocalist and has won ACM's 2007 Best New Female Award and 2008 ACM Album of the Year. With this much artillery under her belt, it's no wonder that the Texas vixen is being touted as "country music's most refreshing act" - and her live shows are certainly no exception. *Kerosene sold 39, 739 debut week and with a 25% increase Crazy Ex-Girlfriend sold 52,993. With 68, 875 first week, Revolution showed a 23% increase from Crazy Ex-Girlfriend and 42% increase from Kerosene.